Greg Oden and Kevin Durant were named in the same article today and not once did anyone mention the fact that they were from the same draft or try compare them in any sense. It's great that the media has finally moved on from that same ol' argument, but this article also proves once again that Kevin Durant was the best player in the 2007 NBA Draft. Team USA coach Mike Krzyzewski singled out Durant and showered him with praise following the first day of a three-day mini-camp for a group of 20 young players trying to make the senior national team. Durant was the most dominant player on the floor in the team's 12-minute scrimmage after the squad spent the bulk of Thursday's practice working on drills. Friday's practice was expected to be more focused on scrimmaging. "Everyone who was watching from our group said you could tell that Durant was a little bit on a mission -- and that's good for them to see that, it picks everybody up," Krzyzewski said. "He's that versatility guy, and the other thing is he's a shooter, and with the way we were playing defense for most of the Olympics, with his length, he could be a heck of a defender. "So he's really at the head of the list for me," Krzyzewski said. ...and several team insiders said they were surprised how spry Greg Oden looked. Good for Greg! Anytime someone is characterized as being "spry" I get all giddy. "Spry" just screams 3-time NBA Champion! Doesn't it? I'm not going to make a decision on who was the better pick in the draft for like 10 more years. 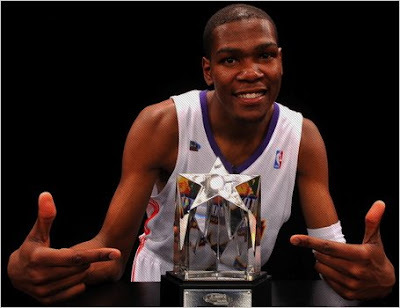 If Oden wins 1-2 more championships then Durant, I'll say he was the right pick! But obviously KD is a stud. Haha, I hadn't had any Oden hating in a while.